Belleville Dodge is the "Home of the Real Deal," meaning we're willing to go above and beyond to give you the best deals we can. We offer some of the greatest prices on auto services in Belleville! There's no better place for cheap engine repair in Belleville. The Belleville Dodge team knows the last thing you want to spend your money on is servicing your vehicle after purchasing. This is why our team gives you the following complimentary service checks when you buy from us, including: alignment check, diagnostic pre-check, battery check, and tire inspection. If you come in and your car is in need of major repairs we can help you with that, as well! Our "Real Deal" promise includes financing options on auto services, including parts and labour. If you're approved, we'll regulate your payments! Looking for cheap engine repair in Belleville? Come down today and check out what our service team can do for you. Our staff are well educated and ready to help get you back on the road. You can find us located on 658 Dundas Street W. in Belleville, ON or give us a call at 613-966- 9936. We make vehicle repair easy andaffordable. Trust your vehicle to the pros atBelleville Dodge! We're proud to have won the 2017Consumer Satisfaction Award fromDealerRater. Belleville Dodge Chrysler is dedicated to finding you the best prices possible. We accomplish this through our complimentary services, finance options, and special offers that are always available. Whether you're purchasing a new vehicle or coming in for servicing, we'll always offer you "The Real Deal". When something major goes wrong with your vehicle, it often means a pricey bill at the end. For these situations, Belleville Dodge has financing options available to ease your way through the repair. Instead of paying up front, we'll set up a payment plan that regulates your bill to a more affordable level. At Belleville Dodge, we're incredibly proud of our terrific service team and their efficiency. They know what to look for when your vehicle is acting up, can order in parts at the cheapest available cost, and service your car in a timely manner! Along with complimentary inspections, we also offer a valet and shuttle service while you wait for your vehicle to be finished! Belleville Dodge not only offers great deals on vehicles, but on servicing as well! 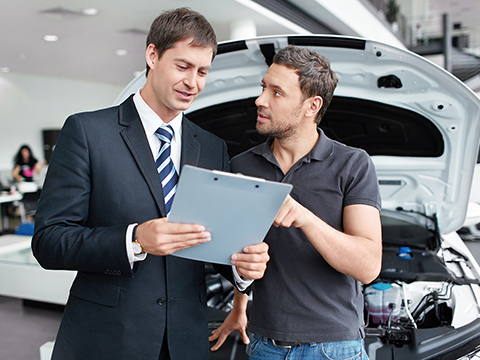 Visit our Service Promotions page to check out everything we have to offer. 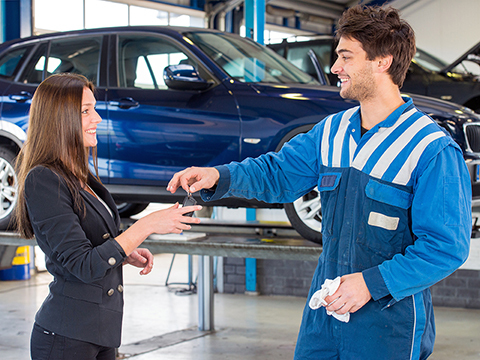 If you purchased a vehicle with us, you are also entitled to complimentary services such as: alignment check, diagnostic pre-check, battery check, and tire inspection. When was the last time you felt right at home in a dealership?At Belleville Dodge, you're more than just the next sale orservice appointment. We treat you like family! From ourextensive selection of top-quality new and used cars, trucks,and SUVs, to our excellent financing options, to theexceptional service in our service department, you'll find ourunwavering dedication to your satisfaction. But don't just takeour word for it! We're proud to have won the 2017 ConsumerSatisfaction Award from DealerRater. Stop by, and discover abetter way to hit the road at Belleville Dodge! You can find usat 658 Dundas Street W. in Belleville, ON, or give us a call at613-966- 9936. We look forward to going the extra kilometerfor you! I walked in to find a new vehicle and they took the stress out of finding it. I found the right Jeep within my budget and I had fun doing it. Thanks Chris! Was searching around for a truck, then came across Ralph Neale's. They helped me find a truck perfect for me! Lots of respect and amazing service! Would totally recommend! Ensured we knew exactly were getting, not pushy about it. Not in a rush and open to discuss options of the deal. Patient with our own indecisiveness. Has a great area where our 2.5-year-old can roam and destroy, the employees were also very accepting of his need to be a two-year-old.